To the west, you will find the Bluffs Coffee Shop (closed for the 2012 season), service station, and information center and to the east, the 24-room Bluffs Lodge (closed for the 2012 season) and a picnic area, for information call (336) 372-8568. Doughton Park, located between milepost 238 to 246, contains classic scenery with some of the most memorable photo opportunities anywhere along the Parkway. This 6000 acre area was once called the Bluffs until 1961 when the name was changed in honor of Robert Doughton, a former member of the US House of Representatives. He played a key role in the creation of the Blue Ridge Parkway. This area allows backcountry camping at a designated primitive camping site off Grassy Gap Fire Rd Trail with a free permit. 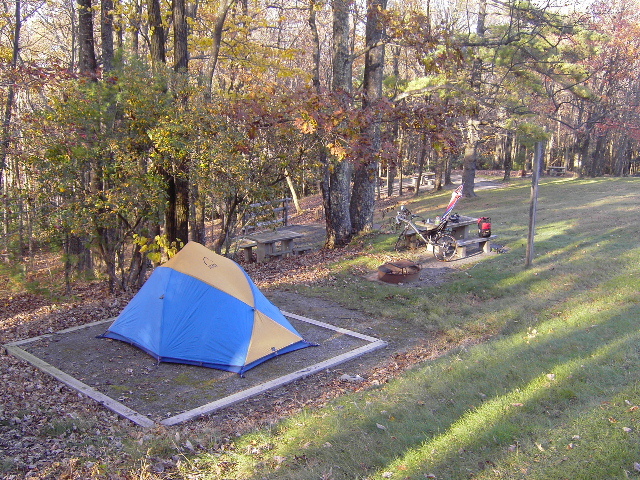 For those looking for other lodging, there is Doughton Campground with 110 tent sites and 25 RV sites. There is also the rustic Bluffs Lodge for those looking for accommodations with four walls. Doughton Park also has a picnic area with 56 sites near the lodge. This is near a popular section of the Bluff Mountain Trail as it winds over meadows and pastures to memorable views. There is also a small camp store, coffee shop and restaurant available for visitors. This is one of those sections of the Parkway that you may need more than just one day to explore all it has to offer.